I'm really proud of how well this turned out! It was a summery birthday cake for my younger sister Victoria but I only just got around to writing up the recipe. It not only looked good, but the coconut cream made it very moist. The lime and coconut flavours made this sponge much more of an occassion cake and the flavours complimented my sister's love of Malibu! Heat oven to 170C. Grease and line two 20cm sandwich tins. In a large bowl, beat all the cake ingredients together until you have a smooth batter. Divide the mixture between the two cake tins, smooth the surface to an even level, then bake for about 20 mins until golden and firm to the touch. Turn onto a cooling rack and leave to cool completely before removing from the tin. Meanwhile make the frosting; whisk the egg whites to stiff peaks. Combine the sugar with 4 tbsp water and heat over a gentle heat until you reach a syrup consistency. Beat the slightly cooled syrup into the peaked whites with an electric whisk in a constant steady stream until completely combined and mallow. Refrigerate until your cake is cool enough to frost. Spread a little of the frosting mixture onto the top of one of the cakes and then sandwich the two together. The cover the top and sides with the remaining frosting. 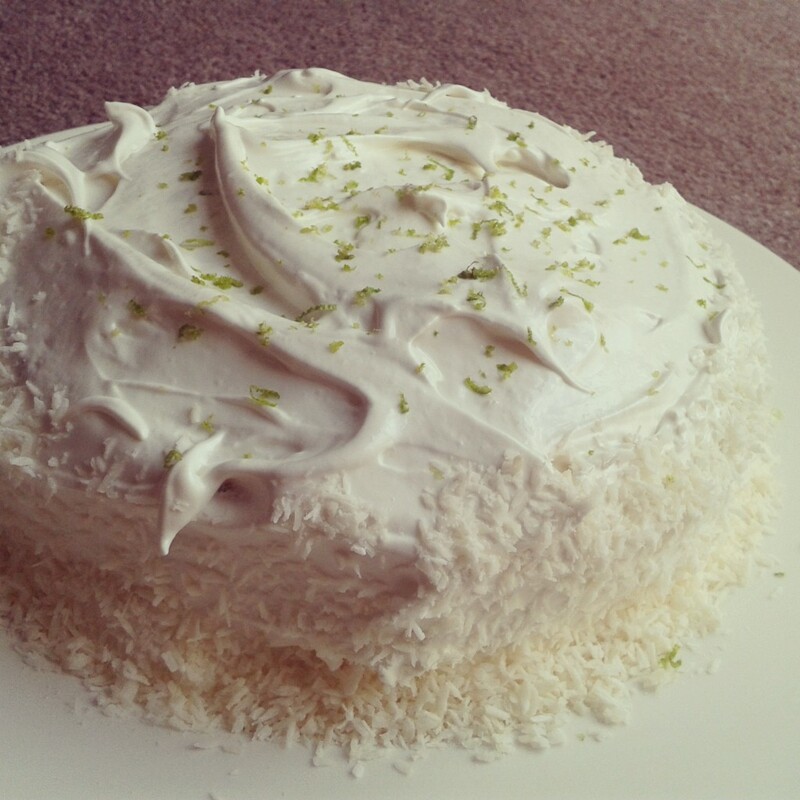 Gently press dessicated coconut all over the outside and grate lime zest over the top to finish!